The moment of force (or torque or turning effect of force) is the product of the force and the perpendicular distance from the pivot to the line of action of the force. Distance used to calculate moment of force F1 is d1 as d1 is the perpendicular distance from pivot to the line of action of force F1. Distance used to calculate moment of force F2 is d2, not d1 as d2 is the perpendicular distance from pivot to the line of action of force F2. This means the turning effect of F2 is smaller than that of F1 as d2 is smaller than d1. Turning effect of a force is 0 Nm when the force is applied at the pivot as perpendicular distance is 0. ﻿Moment is not same as force! !﻿ A very common misconception here. Many students tends to think that moment is same as force. 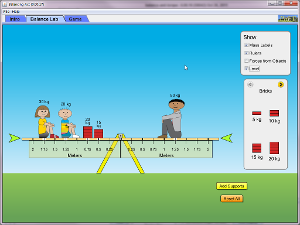 (1) After opening the applet, select Balance Lab. (2) Move the slider located below the beam to the right so that no supports for the beam. (3) Select Mass Labels and Rulers on the right. (4) Place a pile of 15.0 kg of bricks to 0.25 marks on the left of beam. You will see that the beam rotates anti-clockwise. (5) Now, place a pile of 5.0 kg of bricks to 2.0 marks on the right of beam. You will see that the beam rotates clockwise although 5.0 kg of bricks is lighter than 15.0 kg of bricks. Why is it so? From here, we can see that clockwise moment is greater than anticlockwise moment. So, the beam rotates clockwise.